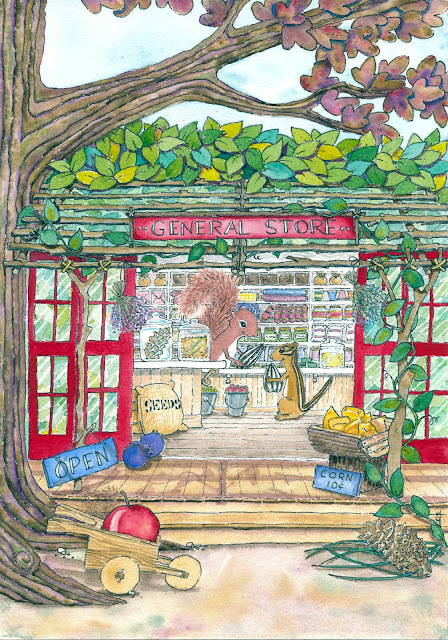 As way of introduction, this is Zella the proud proprietor of the General store in the village of Elderberry Hedge. Zella took over the running of this very useful shop several years ago and she quickly became well known to all who live in village as an extremely helpful squirrel; always willing to lend a hand. Zella's store has a "little bit of everything" and all is kept in excellent order. Townsfolk and visitors often comment on the neat appearance of the store to which Zella will always smile and reply, "A place for everything and everything in it's place." Zella is quick as a wink at filling customer requests, so much so that townfolk say when you go to Zella's store and ask for anything, it's in your hand before you have time to change your mind! Partly due to her amazing organizational skills but mostly due to the fact that Zella simply loves chatting with everyone who comes into her store. "If you get business out of the way quickly there will always be more than enough time left for catching up with friends!" Every October the townsfolk of Elderberry Hedge celebrate the harvest with a Fall Festival Bonfire and each year Zella donates a big bag of popping corn kernals so that everyone can enjoy popcorn-on-a-stick by the bonfire.... You cannot attend the bonfire without becoming a willing spectator of an impromptu school: watching Zella show the younger children how to spear their popped corn with a clean thistle prickle and then instruct the older ones how to do the same with a Honey Locust thorn. When Zella is not at the general store she loves to go on hikes through the woods looking for interesting pine cones - she loves collecting them! Her collection is quite extensive, even including a very rare Monterey Pine cone which she traded with a badger for a sack full of oats. P.S. I am indebted to Emily Ann for the imformation listed above. I was only just being introduced to the village of Elderberry Hedge when I documented Zella's store with the painting I included above. I'm sure my travels will allow me to re-visit Zella's neat-as-a-pin general store and after a while I will hope to have heard enough stories to share some her wonderful adventures in Elderberry Hedge with you!